While we're all waiting for our very first EVE Online novel from Tony Gonzales (Theodicy and Ruthless), I was thinking current science fiction novels that remind us of the EVE universe. Which novels have you read which reminded you of EVE's setting, its feel, it vastness and decadence? If there's one series that does this for me it would be "The Gap Cycle" from Stephen R. Donaldson. It does so not necessarily because of the story or setting, but much more so because of the mood, the smell of things I would even say. It's a cold, ruthless and violent universe and that reminds me a lot of EVE. I strongly recommend the series if you have not read it. But what about you! Have you read any novels that seem to capture a part of EVE? If so, then please let me know. I'd be very interested in having a look and then letting you know. So I'm back in EVE, playing on a more regular basis since the birth of my daughter, Florence. And I have to say, I don't know why exactly, can't really pinpoint it, but this game is still addictive, still fun and still challenging. The guys from PPL are a great bunch and I consider myself privileged to by flying with them. We're currently ice mining in QXQ, a system within the Firmus Ixion sovereignty. I have an XBOX and a PC, and have a good number of games for both. I used to play games on my XBOX a lot more in the past, but as time goes on, I find myself more and more doing so on the PC. In the end I have to admit that I'm a PC Gamer. Consoles are great, and the XBOX 360 is a sweet piece of gaming machine, one that I might, make that will, get eventually - Gears of War and Mass Effect anyone. I was looking at my Gamespot profile earlier today, and realized that I not only owned more PC games than XBOX games, but that most of my tracked ones and the ones on my wish list were also PC games. And that's largely the results of the types of game I like to play: one MMORPG in particular (EVE not to name any), as well as RTSs and RPGs. Most of the FPS games that I play, I do so on the XBOX. Don't ask, it just feels more natural to me. There are three gaming magazines that I read, "EON" (subscription), "PC Gamer" and "Games for Windows - The Official Magazine". For someone so into EVE as I am, E:ON is a godsend! Such a fine piece of journalism, short stories and informative articles on game play. PC Gamer is a magazine that I'll pick once in a while, only if it has an article on an up and coming game I'm interested in - or when they have those "Build your Dream PC" special issues. As for GFW magazine, I've bought all first three issues, and so far I must say I like what I see. I think Microsoft is finally stepping up to the plate and acknowledging how important PC as a platform is. And GFW is a huge step forward. So how about you? PC or console? 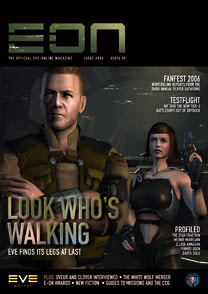 And whatever the platform, what gaming magazine to you read? Please feel free to use the comments to voice your opinion. Me! In response to Ethic's recent post over at Kill Ten Rats, here's a list of five items you probably never knew about me. I'm French Canadian, and English is a second language to me. Even though you'd never guess with such a family name, English was something I learned at school, not at home. And yes, that means I speak French at home. I live in Quebec, Canada where French is the official language. I learned English while living in Jamaica as a 10 year old. Yeah man! We only stayed for a year, then dad got transferred back to Montreal. And since then, I've been reading, speaking and writing in Shakespeare's tongue. My first computer was an Apple IIe. Man did I love that machine, and almost had a heart attack when I learned that folks had thrown in the garbage a few years ago. I still dream about it. I became a "real" gamer only 6 years ago. I used to have Macs before, and even though I used to work for Big Blue, I did not have a PC. Then, after buying my first PC, I installed Diablo II. The rest is history. Though I'm writing this on a PowerBook G4, my home PC runs XP (and soon Vista). My wife and I are expecting our first child within the next few days! Hello fatherhood. They say Gamer Dads are the best! Well there you have it. Now you know a bit more about moi! What about you? Let me know with a quick comment. A new look for the new year! I was getting tired of the old look and wanted an easier way of making changes. Doing everything through HTML was getting to tedious. SO with the new Blogger, I decided to update the whole site. I like the results, do you? Let me know. P.S. : I also added the Snap Preview Anywhere widget that lets you preview the sites by hovering over the link. I think it's useful, especially to quickly see if a link is broken. Let me know if you find it too much in the way. I wish you all of a very happy new year, lots of gaming fun, be it on the PC, or your respective console, be it in an FPS, RTS, MMORPG or other genre. May this new year bring us better games, new genres or genre defining games, new and forward thinking initiatives from all publishers, big AND small. Good luck to the new MMORPGs that will see the day this year, and here's to the current ones. Cheers cheers!! These last ones, may you see your subscriptions and revenues grow, may we see new players join the fun and fury - not just migrate from another game - and lets have more fun today than yesterday, and less than tomorrow!! As for myself, I hope to find the time to play as much as I want to, knowing that this year will be full of surprises!! Indeed folks, this is the year that I shall become a father! And if I believe the press, I shouldn't worry at all about my parenting skills, au contraire! In preparation for the grand arrival, I've started playing old and new games which I can stop at any given moment (blessed be the PAUSE): Halo 2, 1701 A.D. and Dungeon Siege II. Though I still plan to spend a good amount of time in EVE, sometimes PVP missions simply won't be possible for this big daddy. I'll let you know how things go when the time comes. In the mean time, I would appreciate any advice. So if you're a gamer dad, or gamer mom, and can still balance your gaming need with your responsibility of parenthood, then please feel free to dispense your advice. I'll be more than happy to listen!